Armenian national team midfielder Henrik Mkhitaryan has donated TVs, washing machines and refrigerators to 15 families of war veterans in Karabakh as part of his second charity visit to the republic on Wednesday. Accompanied by Armenian Football Federation (FFA) head Ruben Hayrapetyan, Ukrainian Shakhtar Donetsk’s 22-year-old midfielder attended the fifth conference of the Union of Artsakh Warriors-Liberators held in the Karabakh capital of Stepanakert. This is the second charity visit by Armenia’s up-and-coming player to Karabakh. He paid his first at the end of last year. 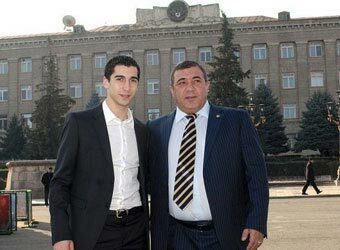 In Stepanakert, Major-General Samvel Karapetyan awarded Mkhitaryan with the NKR Prime Minister’s medal, and FFA president Hayrapetyan with the NKR “Defender of the Homeland” medal, the FFA’s press service said. Mkhitaryan is expected to visit Gavar on December 16.